Pros: The playpen opens in seconds. It is lightweight and has wheels on one side for an easy move between rooms. Includes a carry bag. Cons: The playpen can be tricky to fold. The base is hard and not suitable for naps without a mattress. The Cosco Juvenile Funsport play yard is all about keeping it simple, and this is largely why it is so popular with parents. It is a cheap, reliable playpen for parents who just need a playpen without the fuss. It is safe and easy to use to guarantee stress-free play. The playpen comes with mesh screens and a solid bottom, it unfolds easily and wheels to wherever you need it, making it a dream to use. You will find the full Cosco Funspot play yard review below. Parents that need a playpen without the extras. Sometimes all we need it a playpen. Although others do come with bassinets and change tables, the Cosco Funsport keeps it simple, providing a pop-open area for play to use which forgoes the extras but does not forgo the convenience. The Funsport playpen opens up in seconds and is truly a delight to use, and I found I didn’t even need instructions to open it. However, folding it back down can be slightly tricky as it has a tendency to get stuck. The playpen is folded via a squeeze latch, which is easy enough to use once you have done it before. Being smaller than other playpens, such as the Graco Pack N Play, has its advantages, and this playpen really is portable. It is lightweight at around only 19lbs and well equipped for travel. There are two wheels found on one side at the base, for a quick slide around the room. The playpen also folds to become a carry bag, making it perfect for travel. The playpen is a good size at 40” x 30”, with plenty of room to play. However, the playpen does not include a mattress, and the base is thin and quite hard. In and of itself, it is not suitable for naps but fine for short-term play. The base is also not completely flat, but this is not really noticeable. Playpens can generally be used until your child is big enough to climb out. The Cosco Funsport Play Yard is suitable for a child up to 35 inches tall, which is on par with other playpens. For most kids, this will be around 2 years old. The playpen is very sturdy and is definitely not going anywhere. The mesh walls allow you to keep watch of your child to ensure they are safe. Although the base is hard this adds to the safety aspect. For added safety, the playpen is better used on carpet than hardwood floors or tiles. You can choose from a range of patterns from neutral safari animals, to pink flowers and polka dots. Its up to you! The fabric itself is not removeable and thus not machine washable, but can be spot cleaned. The playpens exact dimensions are 40″L x 30″W x 28.24″H. The Funyard can be slightly difficult to fold. It is also not the best playpen for sleeping due to the hard and uneven bottom. However, with the addition of a mattress (such as the Dream On Me 3” foam mattress, which fits perfectly) it becomes comfortable for sleeping. As other Cosco Funsport play yard reviews have pointed out, you will find it tough to find a better value playpen. 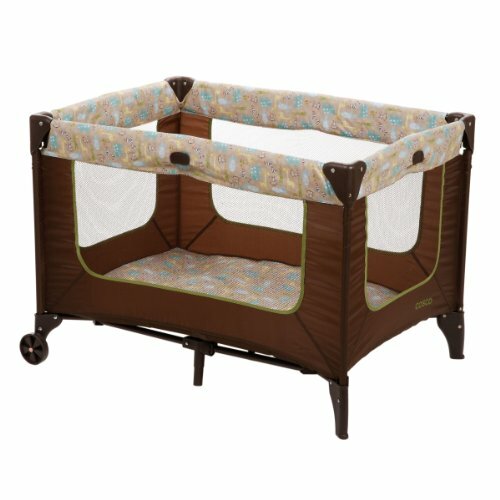 This playpen is reliable, amazingly affordable and great for travel. For those parents that just need a simple playpen, there really is no doubt that this playpen is suitable for you. 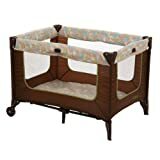 If you want more play yard options then have a look at my reviews of the best play yards, or read our Travel Crib buying guide to look how how to identify the best travel crib for your child.